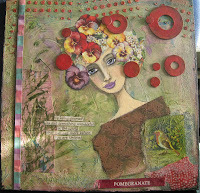 "Pomegranate" is a mixed media collage portrait on wood. This painting was inspired by an artist, Monica Zuniga, whom I admire very much. 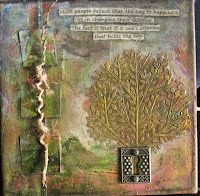 "Holds the Key" is a mixed media collage on a small canvas 8x8". Beautiful work Renee! I love the texture on both pieces - molding paste? Just lovely - congrats! I love, love, love that first painting! The washers, the portrait - everything about it. "Pomegranite" is fantastic! I love that you're becoming more abstract with her hair & clothing. Wonderful textures and color.